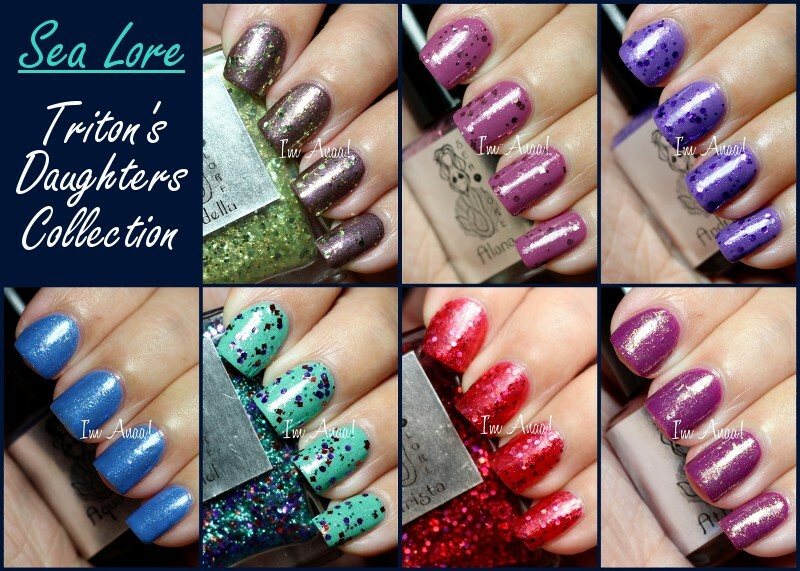 This is not a new collection so I'm sure you've already seen these polishes before BUT I swatched them a little while ago and I don't want these photos to stay hidden in a folder on my computer. Yes, I'm still clearing my manicures folder! lol I try to post new pics and old pics alternately on the blog and last post was recent swatches of the gorgeous Girly Bits Gloss48 Exclusive Trio, so now it's time for some old ones. The first one is Adella, "a seahorse yellow jelly base with mint green hexes, gold glitter, and golden shimmer." I applied one coat of Adella over Essence Princess Prunella. Alana is "a sea anemone pink jelly polish with rose colored hexes and rose shimmer." I applied one coat of Alana over Essence Meet Me Now! Next, we have Andrina a "deep sea urchin purple jelly base with purple hex glitters and purple shimmer." I applied one coat of Andrina over Essence Oh My Glitter! Ariel, my favorite from this collection - because it's gorgeous, and because, well... Ariel! duh :P - is a "bright turquoise jelly base with red squares, purples hexes, green glitter, and green shimmer." I applied one coat of Ariel over Essence Viva la Green. Next one is Arista, a "deep crimson jelly polish with red holo hexes and red shimmer." The jelly base of this one is way more opaque so I only applied 3 coats of Arista for these swatches. The last one, Attina is a "coral jelly polish with golden shimmer and golden iridescent flakies." As coral isn't really a "me" color and because I love this combo, I applied one coat of Arista over Essence Lilac is my Style for these swatches. I previouly used Attina on top of my watercolor nails. 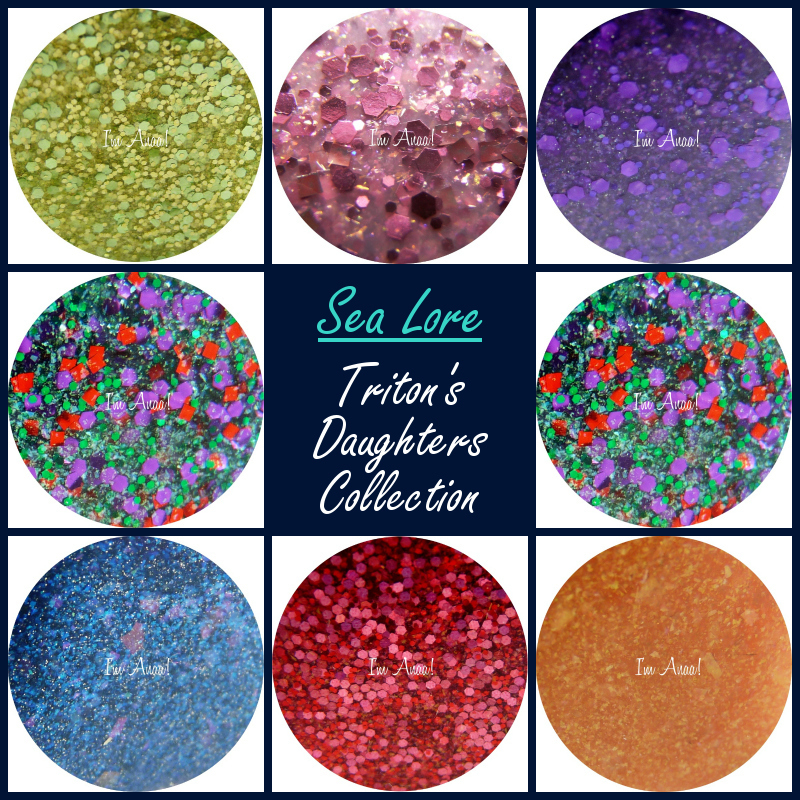 The Triton's Daughters collection can be purchased from Sea Lore's website. They are available in 15 mL and 7,5 mL and they retail for $5.50 and $10.